Function that does not compensate on style, Riomaggiore is a multi-functional timepiece that exudes charisma and character. Dubai, UAE. 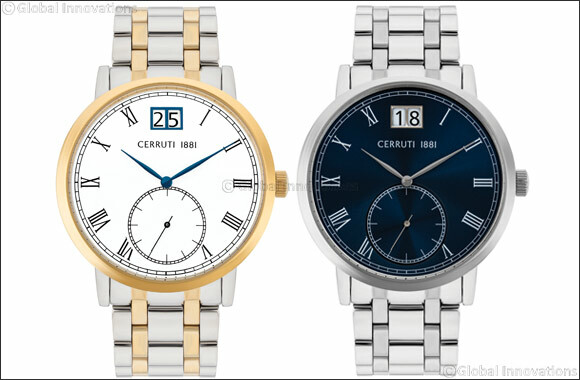 July 26, 2017: A brand that redefines trends, Cerruti 1881 unveils a timepiece that takes sophistication to the heights of imaginative excellence. Simple and chic, the timepiece is a splendid display of class that has its heart in its details. Almost capturing your attention immediately is the bold silhouettes that define the body of the timepiece; a classic, this masterpiece from Cerruti 1881 is a story of precision accented by indigenous detailing. The sunray brushed dial of the Swiss movement timepiece boasts a date window and a seconds sub-dial, which is pleasantly complemented by the metal finish of the body and blue color of the hour hands and the date window. The timepiece comes in a set box matched with pen and stylish cufflinks. The feature that makes the timepiece a connoisseur's pride is the case back of the special edition timepiece. The see-through casing lets you experience the intricate movement of the timepiece – with the gold plating on the parts and the Cerruti 1881 branding on the battery giving the timepiece its final defining touch.